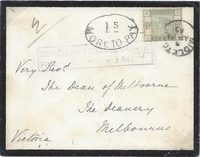 1846 Cover addressed to Ballymoney with, on the front, a very fine P.D/C.RAINE in Green. 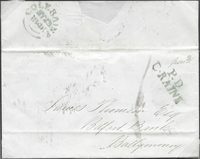 1846 Local entire with, on the front, a boxed PAID AT/BALLYMENA in Blue. 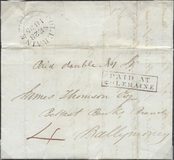 1835 Entire addressed to Ballymoney with, on the front, a boxed PAID AT/COLERAINE, 41 x 11 mm, together with a "Paid double No 1" in manuscript and a MS '4' prepaid in Red. 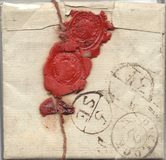 1851 Cover from Manchester to Dalkeith, Scotland, but missent to Ireland and showing A VERY FINE MISSENT/TO/DUBLIN in Red. VERY SCARCE! 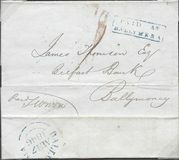 1861 Entire from Ballymena to Fermoy showing a very fine three-line MISSENT/TO/CORK. VERY SCARCE. 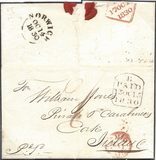 1842 Cover from Drogheda, Ireland addressed to Derby showing a very fine boxed MIS-SENT/TO/YORK in black. 1804 Entire from Dublin to Edinburgh showing a very fine circular-framed POST/PAID/D in circle in black.